Ubisoft if back at it again with The Division 2. This time the Snowdrop powered game comes ready and rocking DX12 to extract the most out of modern hardware. For those who haven’t been keeping up with the game it launched March 14 on Uplay and the Epic Games store, joining a list of titles that have forgone a Steam release lately. And for recent Radeon card buyers this was in their game bundle offering up pretty good value, and as we get through the results it appears that, unlike Assassin’s Creed Odyssey, this investment on their end was worth it for them. 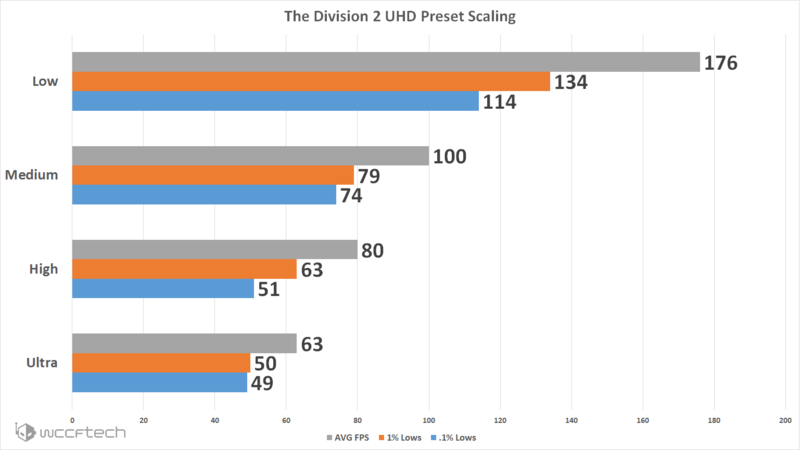 Testing The DIvision 2 was pretty straightforward thanks to a useful built in benchmarking tool. I would typically prefer an in game scenario to run repeatedly but fighting day/night cycles and dynamic weather made that nearly impossible. 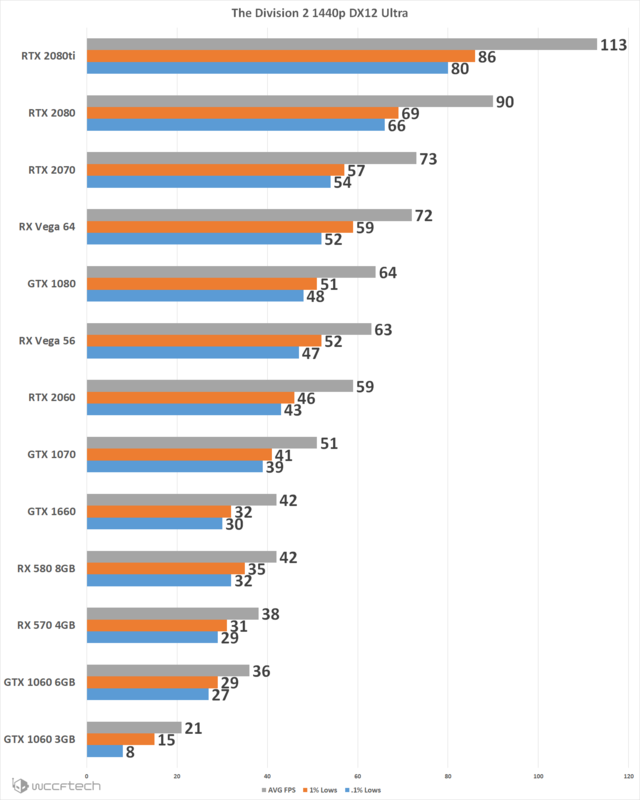 Due to the results in our Private Beta testing we found that DX12 was by far the superior performing API regardless of GPU vendor so that is what we went with for this one. OCAT was employed to track the performance but it does reflect closely the result that the game gives but allows us to run it through my in house tool to extract the Average, 1%, and .1% for each test. We did go with the highest preset on this one with the Ultra preset but with VSYNC disabled. Testing preset performance is a good way to see how the game scales by simply adjusting the presets rather than individual settings for a quick idea. While we did all our testing below you can see that this is a title that scales up greatly in performance as you drop the preset setting. High offers a good balance that makes it difficult to spot differences in but giving good performance boost and would be where I recommend most people start. While this test won’t tell just how many cores and threads the game will and can use it does show how the game performs as you move up in cores and threads available. 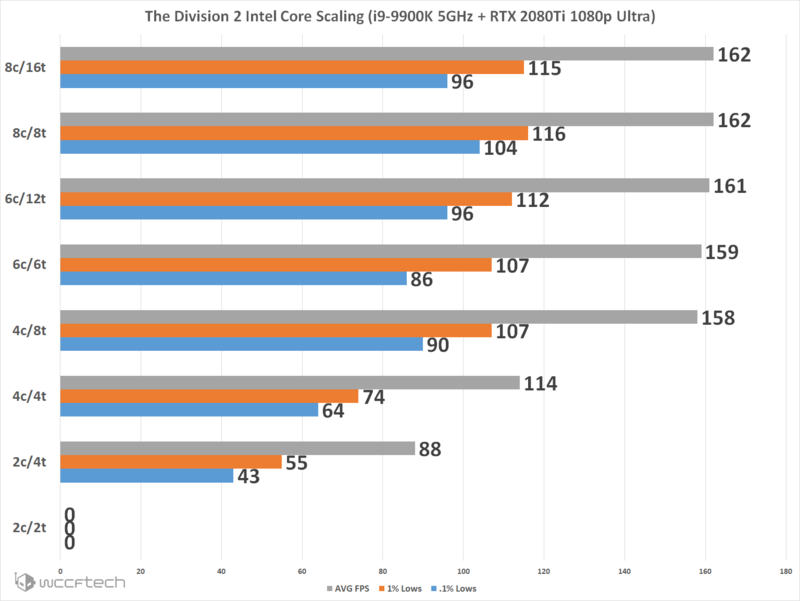 While 8 cores and no Hyper-Threading offers the best overall performance in terms of spread from averages to .1% lows you will be hard pressed to be concerned with moving beyond a quad core with HT enabled for this game. Dual core need not apply as the game would not move past the initial loading screen with that configuration. 1080p already shows that this isn’t going to be exactly the easiest game to have cranked to Ultra, but the performance does scale well up the stack showing that more powerful hardware does indeed run better in this one. 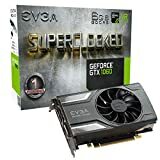 The only card giving a subpar experience at 1080p is the GTX 1060 3GB, you’re going to want to change the settings for sure if you’re rocking one of them or any other card with less than 4GB of VRAM. WQHD starts to put the hurt on for real and if you’re on less than an enthusiast level graphics card prepare for a good bit of tweaking settings to be able to reach over that 60FPS target. This game definitely starts squeezing hard on resources at this resolution. 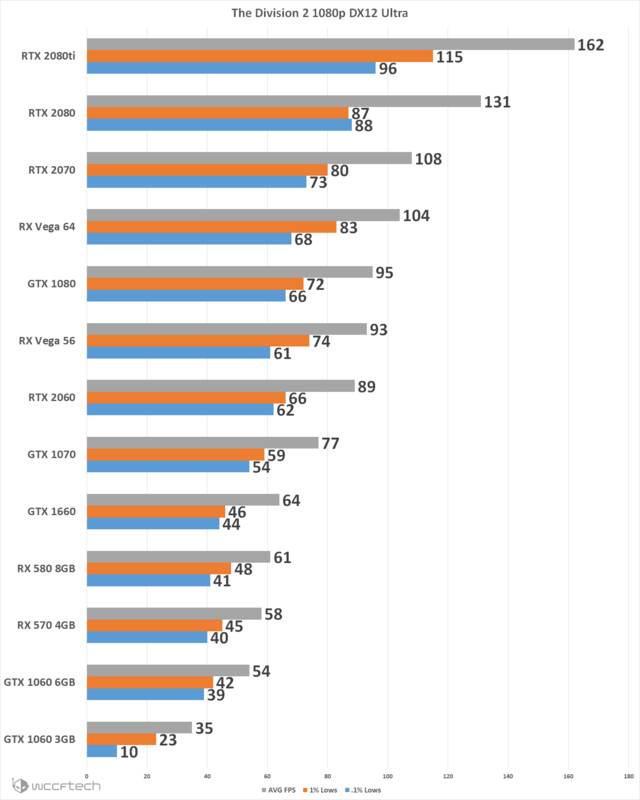 Only one graphics card was able to break the 60FPS average at 4K Ultra in this title. If 4K is your target then you’re looking at a pretty tough time running this one. But, all is not lost as our preset scaling shows that the game does scale really well. This is the one test that the GTX 1060 3GB simply would not run, but then again not much is running it to a playable level but simply here to show scaling at that resolution. Ultra is brutal in this one, but fair. Looking at the game running I still feel high is a great balance of visuals and performance in a game that isn’t a twitch style shooter but still benefits from higher frame rates. The Radeon team definitely has a win on their hands with this and not just a small one showing why they pushed this game so hard during CES and in marketing. 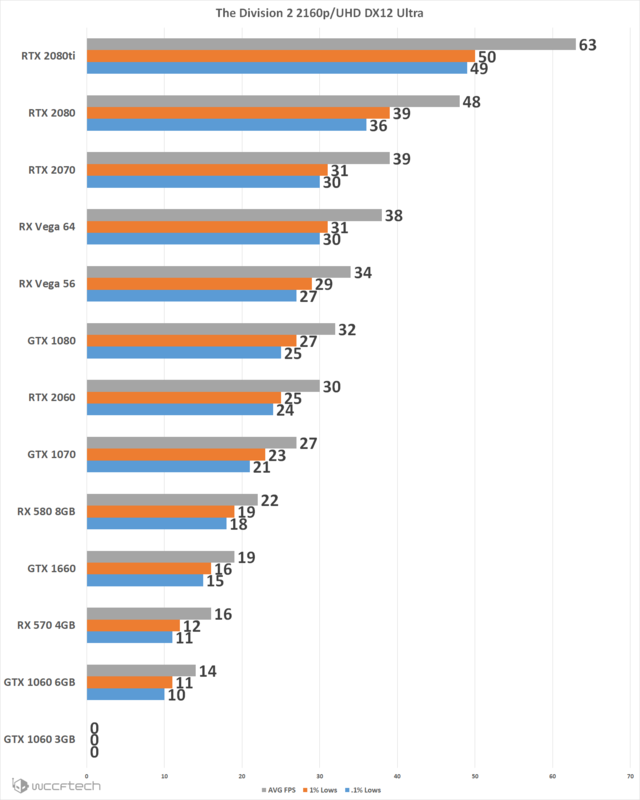 But that’s not to say GeForce lays down either, performance is good all around and even Pascal shows better than expected performance with DX12. It’s time for me to get back to the grind. 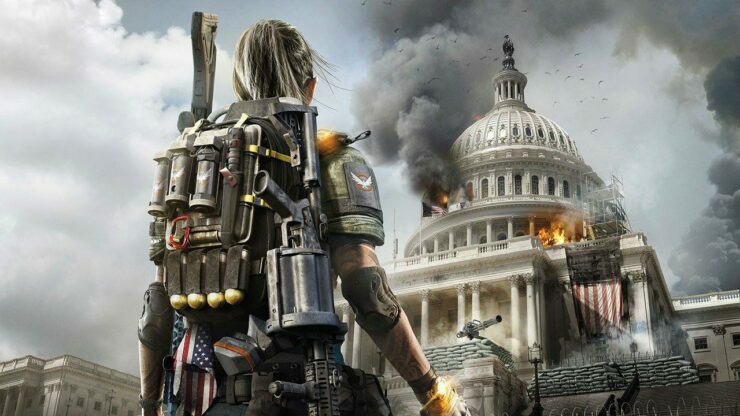 If you’re joining in the fray with The Division 2 share your results in the comment section below along with system specifications.